In Sweden we are blessed with a bountiful of available sources for our genealogical research. In many ways Swedish research is different from other countries since we on-line have access to most records needed. And most records have survived. We try to introduce this principle to all members of the European community but it seems many countries have problems to have this openness. You wonder what they want to hide. Often they hide behind "act of privacy". The swedish church archives have been available on film since the 1950s. The LDS-church made a fantastic work and for many researchers made it possible to search family history up to around 1900. The effort by the LDS resulted in a treasure chest of information and many researchers have been sitting in front of filmreaders until a company - Genline - started converting the films into digital images. Genline also made everything available as a subscription service. In 2010 Genline was acquired by Ancestry for a sum of approx. USD 7 million. 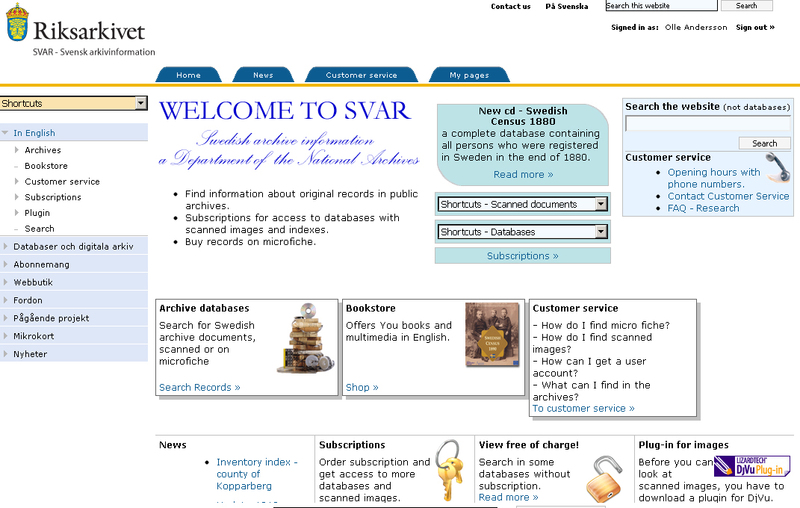 Also SVAR, subsidiary to the swedish national archives offers a similar service based upon the "mormon" collection but have also continued scanning of swedish material, not just churchbooks. Most of their material is B/W but they have started with color. SVAR also have indexed swedish census. These are available both on CD/DVD and online. In a way 2005 was the "dawn of a new era" when the company ArkivDigital entered the arena. They brought in new technology - using digital camera, they produced first on CD, later on-line color images of documents with very good quality. In many cases much more readable than the older b/w pictures. Today they have about 40 million color images covering various kinds of historical documents such as church records, court records and inventory of estates. An example of available images for Värmlands county where I live. ArkivDigital have a very good software for these OS: Windows, Mac and LINUX. And they just released an iPad-version. And there is a demo version for download. Even if I subscribe to SVAR and Ancestry, ArkivDigital is my preferred source for my swedish research. Another coming blog will address a collection of free online sources for research in Sweden.